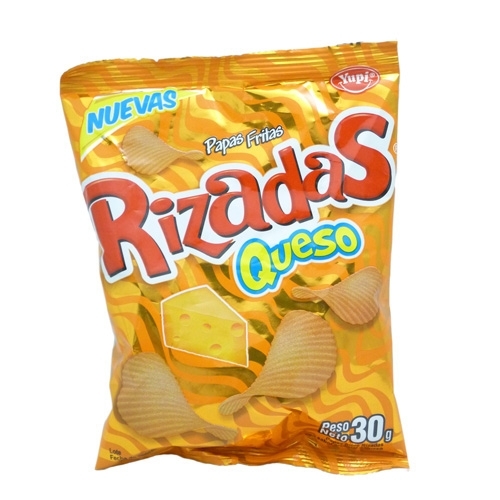 There was a snappier crunch to these Chips than with many other in the Rizadas range. This may have been because the oil had been soaked up by the powder, but whatever it was, the crunch was more consistent and lasted for most of the Chip's life. Fairly thickly cut and with narrow Ripples, these Chips featured undulations rather than Ridges. The natural yellow of the Chips was replaced by a heavy coating of orange seasoning powder. There was not much of an aroma when we carried out a Nose Plunge Test. The flavor was definitely cheesy, but it felt very synthetic. Somewhat like the rubbery looking Cheese you might find on a burger. They were also very salty, which did not help the flavor.